David B. Brown, a retired Potter Anderson partner, is a past chair of the firm and a former chair of the firm's Business Group. He became of counsel to the firm in 2010 after nearly 30 years as a partner practicing principally in the area of corporate transactions, including mergers and acquisitions, joint ventures, licensing arrangements, and business counseling. Frequently working with foreign companies in their U.S. business transactions and planning, he negotiated and drafted numerous acquisition and sale agreements and joint venture agreements as well as a number of manufacturing and distribution contracts and complex licensing agreements. Prior to his joining the firm, he worked in investment banking at Merrill Lynch in New York and, later, as a lawyer with Covington & Burling in Washington, D.C. 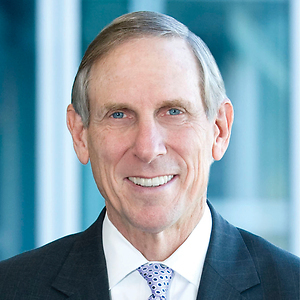 Currently, David devotes his working time exclusively to charitable and pro bono endeavors, and is active on the boards of several charitable organizations including Delaware Volunteer Legal Services (“DVLS”) (Officer and Past Chair), Delaware Hospice (Officer and Executive Committee member), Planned Parenthood of Delaware (Executive Committee member and Past Chair), and the Delaware State Chamber of Commerce. He also serves on the Executive Committee and as an Officer of the Carpenter-Walsh Delaware Pro Bono American Inn of Court, which promotes pro bono efforts by members of the Delaware Bar, and on the Advisory Council for the African American Heritage Center of the Delaware Historical Society on whose Board he previously served. He is a Class Agent for the University of Virginia Law School. He helped found and previously chaired DVLS, a state-wide volunteer lawyer program that provides pro bono legal services to the poor, and currently chairs a committee of the Delaware Bar Association exploring opportunities for pro bono service by retired lawyers. He has served on the finance committees of Senator (now Vice President) Joe Biden, Senator Tom Carper and (former) Governor Ruth Ann Minner, and as State Counsel for Delaware to the Democratic National Committee. He has been honored for his volunteer efforts with awards from the Governor, the Delaware State Bar Association and various charitable organizations. David is listed in The Best Lawyers in America and has received an AV® rating in Martindale-Hubbell's peer review certification. AV® is a registered certification mark of Reed Elsevier Properties Inc. and is used in accordance with the Martindale-Hubbell certification procedures, standards and policies.